Helena Fensome beat the strongest field yet assembled for the 'Blue Ball' tournament today and achieved the handicap reduction to scratch that she has been looking for all season. With the exception of Ian Norris and Charlie von Schmeider, the six player field assembled, was the top half dozen players in our Club. This was reflected in the closeness of most results with every player winning at least two of their five games. The weather played a big part too, when heavy rain soaked our already saturated courts and forced a suspension of play for 90 minutes. Upon resumption court no 2 was no longer playable, and all remaining games had to take their turns on court 1. Roger Goldring had a fine start to his day, with a first victory over second seed Chris Roberts, and then followed this up with a win against David Hopkins later on. Roger had a good tournament over all. Hopkins was the only one who could dent Fensome's progress, but she bounced back with victory over Roberts and then had a surprisingly comfortable win against top seed Carole Jackson. Going into the last game Fensome had to beat Frances Colman to pull clear of the field on game wins and thus avoided the possible multi-player tie that had been looming, which would have necessitated some working out. 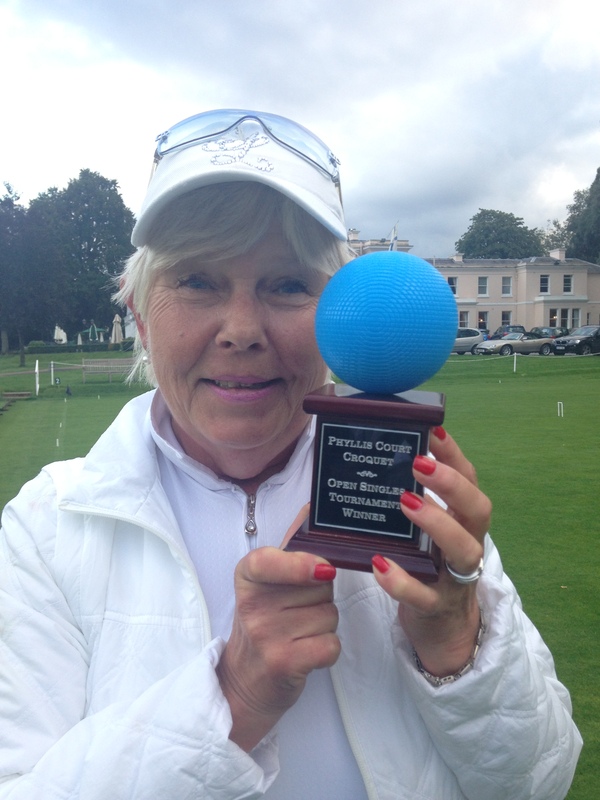 She pulled off the victory and so lifted the 'Blue Ball Trophy' again having won the event in 2013. Fensome is the first two time winner of this tournament. 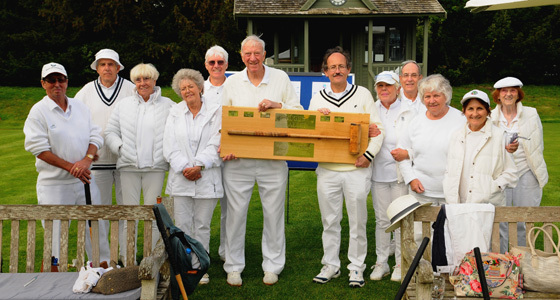 PCC Croquet won the annual duel-game match v the Bridge Section yesterday, reports Manager Robin Morrell. Fittingly, the Bridge Section won the morning session of bridge by 16 points to 9 and the afternoon of golf croquet went the other way. 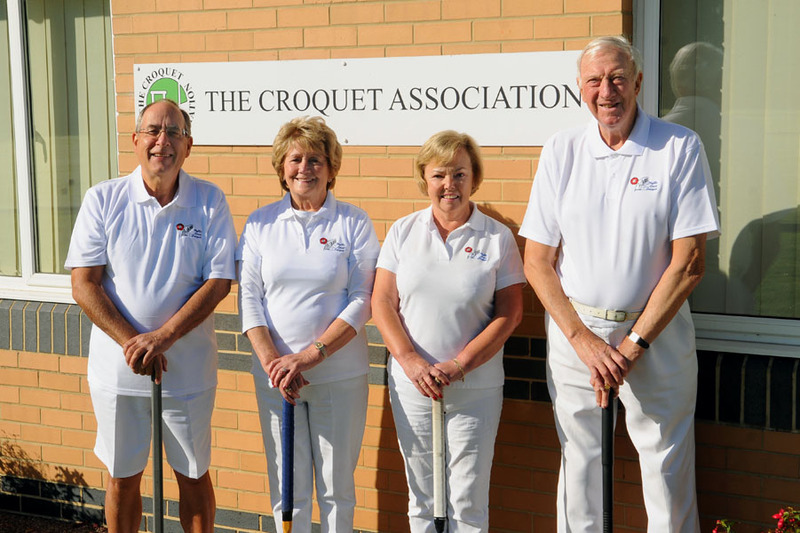 The fixture went right to the wire when Croquet took their adavataged leg 17 to 8, meaning a close final result of 26 to 24 to PCC Croquet. 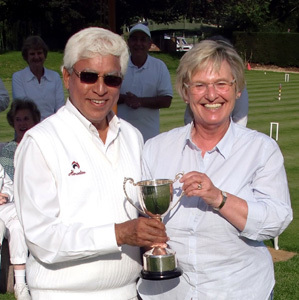 The Connel Girdwood Cup was presented to the Croquet captain, Raghu Iyer, by the Chairman of Bridge, Carel Barker. Helped by a lovely day, the event was enjoyed by all who took part. A 'Friendly' team captained by Pat Eades drew a match with Thames Valley at Phyllis Court today. Ian and Delia Norris (fresh from their sucess at Hurlingham a week before) were the stars of the show and won all of their four games. There is a return match at Thames Valley on 23 September. PCC Friendly: Pat Eades, Ian Norris, Raymond Wood, Delia Norris, Ralph Chambers, Geoff Crocker,Nina Cox, Geraldene Clayton. Bransgore were too good for PCC 'C' in the Federation final between the winners of the north and south handicap divisions. Winchester hosted the final as last season, but there was to be not repeat of PCC 'C' 2014 success. Hugh Crook came in as a late replacement for the ever present Delia Norris who went down with an awful cold on the eve of this crucial end of season encounter. However she was kept in touch by a string of 30 or so text messages from Chris Roberts who copied in Leagues Manager Frances Colman, for whom he was deputising on behalf of the Southern Federation. Colin Morgan won his singles but Dianne Browne lost hers and doubles pair John Chalfont and Hugh Crook also fell, giving Bransgore a 1-2 lead at the half-way point. Chalfont went down in straight games in his singles rubber, but Crook kept PCC 'C' in it with a remarkably swift three game rubber that included a 7-0 success in the decider. But soon after, Browne fell at the 13th hoop of her third game when her tactic of preserving her extra turns until late in the game backfire, and the match was decided. Morgan was tied 1-1 in his match but the teams decided to not to play that match out to a finish. PCC 'C' recorded a 2.5 to 4.5 result and the SCF Handicap title went to Bransgore for the first time. Raymond Wood won the last of our three Drawn Partners tournaments when he piloted Edmund Shirley to victory this afternoon. This is the first time Wood has won this particular event and it was a inaugural victory of any kind for Shirley. The disappointing field of just six pairs was the smallest ever for what used to be our 'ever popular' DP tournaments. This follows the decline in numbers noticed over the last three years in this style of event and interest is clearly on the wane. Nottingham were just too strong for Phyllis Court and won the Inter-Club (Murphy) Shield final for the first time, writes Chris Roberts. For Phyllis Court, this was 'the big one' – the first time they had reached any National Final – and it is quite an achievement for the club from Henley-on-Thames, which has a large social playing membership but relatively meager resources when it comes to competitive play, especially at this restricted level. Nottingham, on the other hand, are used to such limelight, and this time it was the occasion for their 'supporting cast' to take to the centre stage, so often occupied by their luminary club-mates. Nottingham fielded rising AC star Omied Hallam (GC handicap 2) as their number one player, and there was much interest in seeing him take on the relatively unfamiliar GC game. He took a while to get to grips tactically, but together with partner Chris Jackson (3) they squeaked the first game of the doubles rubber, but then lost their way in the second, when out-thought and out-maneuvered by the experienced Frances Colman (3) and National B-Level Series stalwart Roger Goldring (3). By the deciding game Hallam had 'sussed it out' and, with good first-ball accuracy, Nottingham drew first blood. Phyllis Court's Raymond Wood (4) beat Bob Thompson (4) in a three-game rubber, and then after a very long tussle Nottingham captain Cathy Turski (4) finally got the better of a game Mary Gaynor (4) to give her side at 2-1 advantage at lunch. Hallam, Jackson and Turski all won their first afternoon games, to put Phyllis Court under tremendous pressure. There was no dampening the friendly banter and obvious pleasure that Hallam and Colman were having in the second game of their contest, which was won at the 13th by Hallam with an excellent shot to position from the jaws of 12. The match victory point came moments later when Jackson's consistency couldn't be matched by Goldring's clearance success rate, and then Thompson added icing to the cake with a two-game win over Gaynor. Wood beat Turski in the remaining rubber to give Phyllis Court something from the afternoon, before John Bowcott presented the Murphy Shield to the Nottingham team, who were then invited to share the champagne that had been held on ice by their vanquished opponents’ small band of supporters. Richard Peperell's journey to this National Final started at Phyllis Court when he was one of four players to qualify from our Handicap Singles (Black Ball) Tournament. 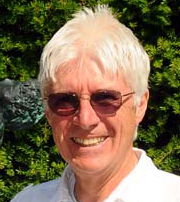 From there, he went to the Area Final at Hamptworth with Ian and Delia Norris and Dianne Browne, but he was the only one of the quartet to progress. He traveled to the Final at Hunstanton (near the Wash) with Competition Director and Finals Manager Chris Roberts and what a long weekend the pair had. Both days ended in near darkness but Richard did well, especially on the second day, and he ended havng won more than half his games.